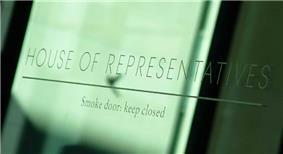 The House of Representatives is one of the two houses (chambers) of the Parliament of Australia. It is referred to as the lower house, with the Senate being referred to as the upper house. The term limit for members of the House of Representatives is a maximum of approximately three years, but may be abridged if an early election is called. 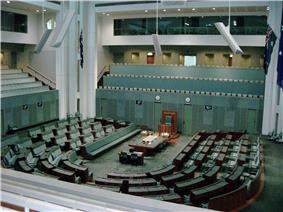 The present Parliament is the 44th Federal Parliament of the Federation. The most recent federal election was held on 7 September 2013 and the House first sat on 12 November. The Liberal/National Coalition won 90 seats out of 150 and formed the government. Labor hold 55 seats and form the opposition. The Australian Greens, Palmer United Party and Katter's Australian Party each hold a single seat, while the remaining two are held by independents. The Commonwealth of Australia Constitution Act (Imp.) of 1900 established the House of Representatives as part of the new system of dominion government in newly federated Australia. The House is presided over by the Speaker. 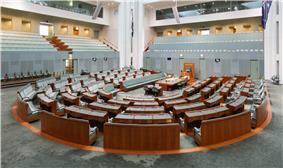 The 150 members of the House are elected from single member electorates (geographic districts, commonly referred to as "seats" but officially known as "Divisions of the Australian House of Representatives"). One vote one value legislation requires all electorates to have the same number of voters with a maximum 10 per cent variation. However the baseline quota for the number of voters in an electorate is determined by the number of voters in the state in which that electorate is found. Subsequently, the electorates of the smallest states and territories have more variation in the number of voters in their electorates, with the smallest holding around 60,000 voters and the largest holding around 120,000 voters. Meanwhile the largest states have electorates with more equal voter numbers, with most electorates holding 85,000 to 100,000 voters. Voting is by the 'preferential system', also known as instant-runoff voting. A full allocation of preferences is required for a vote to be considered formal. This allows for a calculation of the two-party-preferred vote. The current formula for determining the size of the House has the disadvantage that it can result in a House with the size being an even number (as it is at present). When the numbers are very close, this can result in both major parties having the same number of members, meaning that neither could govern. A formula setting the size of the House at twice the Senate minus one, and then determining the representation in each State and territory, would avoid this difficulty. In a reflection of the United Kingdom House of Commons, the predominant colour of the furnishings in the House of Representatives is green. However, the colour was tinted slightly in the new Parliament House (opened 1988) to suggest the colour of eucalyptus trees. The 2013 election was held on 7 September 2013, which resulted in the victory of the Coalition led by Tony Abbott with a 90–55 margin, thereby ending the minority government held by the previous Labor Party government. ^ Madigan, Michael (27 February 2009). "Barking, biting dog House". ^ a b "First house preference by party". Virtual Tally Room: 2013 election.